In an era when fast food chains are competing to offer customers healthier options for breakfast, it's sort of funny — and oddly refreshing — that McDonald's latest breakfast sandwich is pretty unapologetically not so good-for-you ... or anyone. But we still want it. 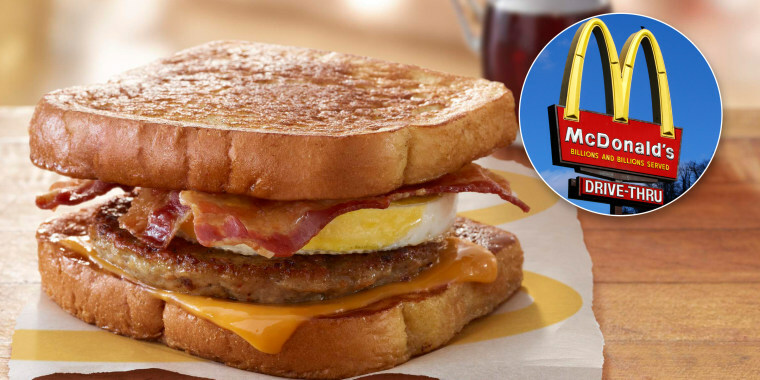 On Tuesday, McDonald's announced that it is testing a new McGriddles French toast breakfast sandwich at over 200 locations in Minnesota. The mighty sandwich contains an egg, American cheese, a sausage patty, as well as slices of thick-cut, Applewood-smoked bacon. Yes, that's two breakfast meats in one sandwich. But things get even crazier when it comes to the bread. It's a butter-based brioche bun that's cooked in clarified butter and flavored with "cinnamon, spice and vanilla flavors." Oh, and it's swathed in sweet maple syrup. "You get savory and smoky flavors from the sausage and bacon," said McDonald's chef Mike Lingo in a statement. "Creaminess, cheddar flavors and salt from the American cheese; sweet cinnamon, spice and vanilla flavors from the French toast. It tastes like homemade French toast. It's everything you love about breakfast in one sandwich." Yes, everything in the sandwich may be lovable, but doctors would not advise eating this all in one sitting. All in, the sandwich has 650 calories and 37 grams of fat. It also has a whopping 385 milligrams of cholesterol, which is 129 percent of the recommended daily intake. Though McDonald's is now serving a limited breakfast menu all day, this new sandwich is only available in the morning hours. In 2003, the chain started offering its first sweetly-stacked breakfast sandwich with the original McGriddle. Each of those sandwiches currently on the menu have fewer calories than the updated French toast version: The sausage, egg and cheese clocks in at 550 calories; the bacon, egg and cheese sandwich has 420 calories and sausage-only McGriddles have 430 calories. They're all also lower in fat and cholesterol than the French toast version. Still, it's unlikely that the above-average calorie count will deter hard-core McGriddles fans from all over the country to make Minnesota a summer road-trip destination.